"I created this salad version of Hoppin John by combining a number of ingredients from other Hoppin John recipes and adding cilantro, tomatillos, and lemon juice for a zesty flavor. The salad is just as good without red pepper for those with discerning palates. Also as an alternative, a favorite hot sauce can be substituted for the red pepper with each individual serving. I like to add a dash of Louisiana-style cayenne pepper sauce to mine." 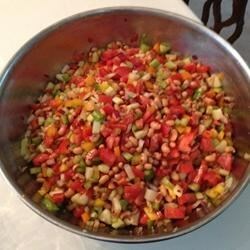 Combine black-eyed peas, celery, roma tomatoes, cucumber, red onion, green, yellow, and orange bell peppers, and tomatillos in a salad bowl. Gently stir lemon juice, balsamic vinegar, olive oil, cilantro, and red pepper flakes into the salad. Chill before serving; serve over romaine lettuce leaves. Excellent recipe, I also added avocado to this! Nice summer salad! Terrific!!! I had to sub in for the black-eyed peas but I wanted to try it& had everything else. So I used 1/3 of each: Lima beans, white beans& chick peas. Makes a large salad!